Home EngagementsNature Engagement Session in South Surrey | Miranda + Joey Vol 1. Nature Engagement Session in South Surrey | Miranda + Joey Vol 1. 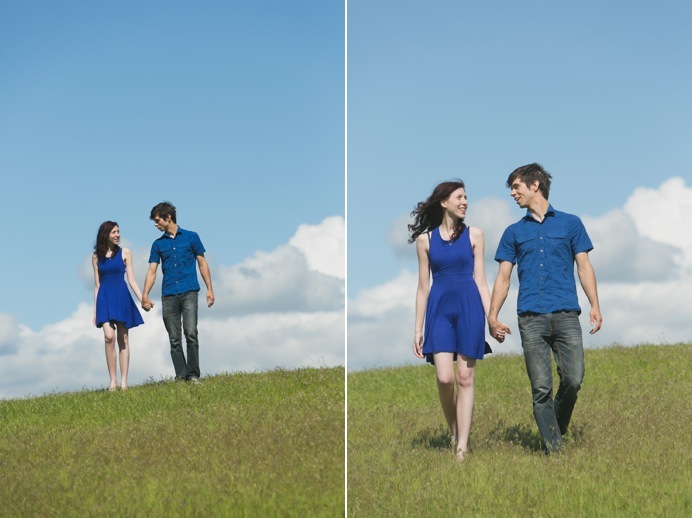 We were blessed with a beautiful blue-sky day for Miranda + Joey’s nature engagement session. Just before we went to the beach, we found a open field and spent some time there. The deep blue sky and fluffy clouds provided the perfect backdrop after months of grey skies in Vancouver. Miranda + Joey were naturals in front of the camera. Every minute they spent together looked natural and authentic because it was. At times, it was like I wasn’t there, which always makes for a perfect engagement session. Afterwards, we wandered to the beach. The tide was out and the sand was soggy, but Joey was a gentleman and carried Miranda through the muddy spots. The sun continued to shine as we enjoyed nature’s gift of dry weather and blue skies that afternoon. In a few months, every day will look like this, but warmer. For now, we just got a teaser of the gorgeous Vancouver days ahead. lovely shots! i love the one of them jumping with the clouds! Lovely session! that first image is awesome! Love that first shot, awesome composition. The location is great! They look like such a fun couple. What a sweet couple…those blues pop so nicely!! And their expressions are really nice and natural!